A University of Alabama student team’s recent success has earned them a new and improved lab space on campus. Alabama Astrobotics team members work on this year’s robot in a brand new lab. The Alabama Astrobotics team has recently migrated from a shared space with Baja SAE Bama Racing and Formula SAE Crimson Racing teams, to its own space in Bureau of Mines 4, the former student machine shop. The new location includes multiple worktables, computer areas and a soundproof and dustproof testing pit. The new space more closely mirrors the real competition space in NASA’s Kennedy Space Center in Cape Canaveral, Florida, making it easier for the team to recreate competition atmosphere while practicing. New additions include a more accurate material in the pit matching the competition substance, and computer stations both facing the pit and on the opposite side of the room to represent accurate locations for team members during the competition. “It helps us function better as a team, getting ready to compete, to mimic everything they have in Florida as close as possible,” Ricks said. Work on the new location began in early October and was completed in mid-January, but the planning process started over the summer with Ricks and Max Eastepp, senior Astrobotics team lead, designing plans and 3D models of the new facility. Preparation for the new lab started as soon as Dr. Ken Fridley, senior associate dean for administration, brought the idea for the new space to Ricks and the team. 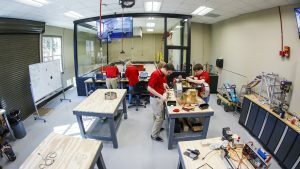 The new Alabama Astrobotics lab has a soundproof and dustproof testing pit with a computer station outside facing the pit. Two UA facilities workers, Trent Hall and AJ Johnston, played an integral part in completing the move to the new location. Hall and Johnston worked to dry and relocate 20 tons of the material needed to fill the pit in order for the team to move into the new space. “We had it delivered in two-ton bags, so we had 11 two-ton bags outside and they shoveled that out and into the [cement] mixer, cooked it while it was in the mixer, dumped it in a wheelbarrow, moved it in, rinse and repeat, and it took them about three weeks to get that done,” Ricks said. “It would have taken us, based on our experience of doing that in the past, two months to dry that material. So that was a humongous help to us. In addition to the new location helping with competition practice, the larger room will help the team to work on multiple projects at one time. “We used to fall behind schedule every once in a while because there wasn’t enough room to work,” Eastepp said. “Now we can work on multiple things at once, our software team has more room to develop, there’s just more room to do everything we need to do at once without having to sacrifice time on a different aspect of the project. 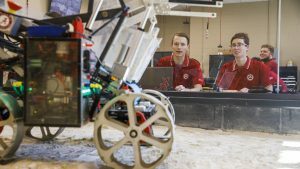 The team will compete for its fifth consecutive win at the 10th NASA Robotic Mining Competition in May.